In A.B. Spellman’s essential 1966 book, Four Lives in the Bebop Business, Ornette Coleman said the following: “The best statements Negroes have made, of what their soul is, have been on tenor saxophone.” As wise as Coleman was, it’s a debatable point: Charlie Parker and Ornette himself both ignited revolutions on alto. But it makes sense, too. Whether Lester Young, Dexter Gordon, or Albert Ayler (to name just a few), black musicians gave their lives to that instrument, told their stories through it, and crafted and refined — and defined — the tenor saxophone’s various sounds and textures. “The tenor’s got that thing,” Coleman went on to tell Spellman, “that honk, you can get people with.” No one honks and hollers, howls and hums, quite like Pharoah Sanders. The native of Little Rock, Arkansas, who got his start in New York with Sun Ra and made his reputation playing with John Coltrane, went on to record an essential series of eleven albums as a leader for the Impulse! label between 1967 and 1974, three of which — Tauhid (’67), Jewels of Thought (’69), and Deaf Dumb Blind Summun Bukmun Umyun (’70) — have just been reissued on vinyl by Anthology Recordings. Coltrane’s later phase of spiritual jazz would transition into the astral, or cosmic, jazz of his wife (and bandmate) Alice after his sudden passing in July of 1967. While Sanders — who was convinced to change his name from “Farrell” to “Pharoah” by Sun Ra — was a key contributor on many of Alice Coltrane’s releases of the same era, also on Impulse!, his own works from this period are significant for their Afrocentric aesthetic, which make them particularly timely now. “Upper Egypt and Lower Egypt,” for instance, is a gorgeous, searching, sixteen-minute Sanders-penned suite from Tauhid. Sanders employed an unusual group for this session, which included Dave Burrell on piano, Sonny Sharrock on guitar, and Henry Grimes on bass, each especially splendid. Sanders, still active at 77, may be most renowned as a tenor, but like many saxophonists he’s well-versed in the entire woodwind family, and early in the piece, he has a striking solo on the piccolo before he raises up a sandstorm with his horn twelve minutes in. The song ends quietly with his own vocal effects — Pharoah as a triple threat. On Jewels of Thought, he assembled a different but equally impressive group of musicians: Lonnie Liston Smith on piano, Idris Muhammad and Roy Haynes on drums, Cecil McBee and Richard Davis on bass, and the inimitable vocalist Leon Thomas. In “Hum-Allah-Hum-Allah-Hum-Allah,” the first of two expansive pieces, Thomas contributes spoken word and his signature avant-yodeling. Sanders reminds us how lyrical he can be, and what an exceptional tone he has, early in the composition, before he takes off into hyper-expressionist cries. Throughout these albums, and especially on Jewels of Thought‘s “Sun in Aquarius,” the sidemen contribute with an assortment of percussion instruments — chimes, rattles, bells, gongs, and kalimbas — which creates a whirl of sound that is earthbound yet otherworldly. Like Jewels of Thought, it has two extended pieces: “Summun Bukmun Umyun” (Arabic for deaf, dumb, blind) and a ravishing Lonnie Liston Smith arrangement of “Let Us Go Into the House of the Lord,” where McBee solos movingly with his bow. If it’s not necessarily the space, or setting, for Shaw to dazzle, it is for Bartz, whose sharp, slashing tone pushes back against Sanders’s soprano nicely. Bartz, still in fine form today, was at a particularly fertile moment in his career as well. Later in 1970, he would record the rich, varied Harlem Bush Music — Uhuru (featuring vocalist Andy Bey), which was reissued recently by the Jazz Dispensary. The cover art for Deaf Dumb Blind is telling: Six black men, standing in the main plaza of the relatively new Lincoln Center, the Metropolitan Opera House hovering behind. It was the neighborhood formerly known as San Juan Hill, a famously African American area. Smith holds a kalimba in his right hand. They wear bold colored shirts, not dashikis exactly, but gone are the accoutrements of polite dress that were required in certain institutions. Do they want in? Or are they set to establish their own cultural pillars? Sanders has had interesting turns in his career. He had a proto–smooth jazz hit with “Love Will Find a Way” in 1977. When I saw him for the first time, at the old Fat Tuesday’s during the Lincoln Center–led neoconservative movement of the mid-1990s, he used an electric bass player, anathema at the time — and brought the house down. The three works here are both of their time (“Sun in Aquarius”) and ahead of their time, as Sanders has helped shape the sound, vision, and sensibility of Kamasi Washington, who has cited Sanders’s Karma as an influence. And that slight pivot away from Western culture fifty years ago has turned into, to borrow a term from Coltrane, a giant step. 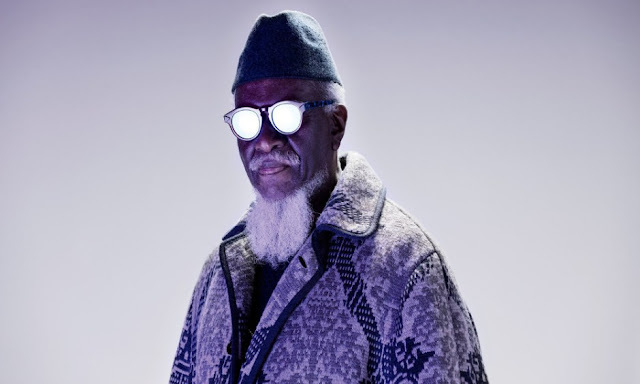 The music on these Pharoah Sanders recordings doesn’t break down into mere tunes, but instead is a journey, into new and old terrain.